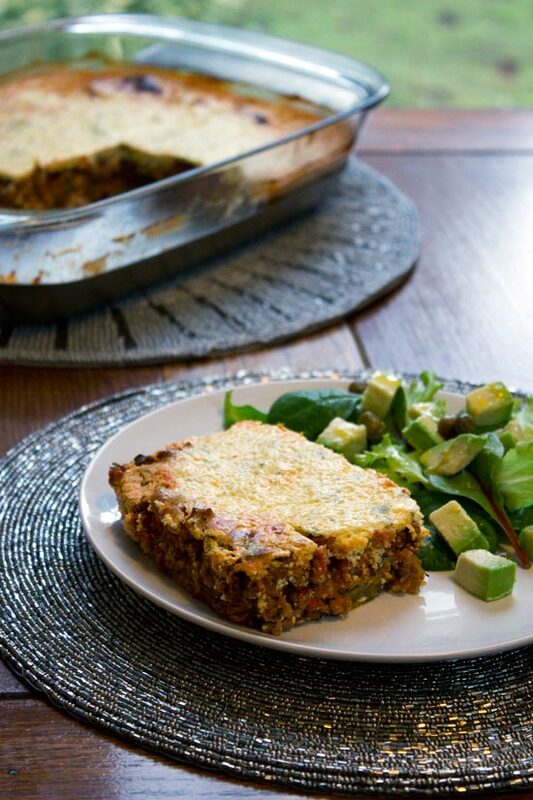 This uses courgette slices instead of pasta sheets, and the yoghurt and egg topping from the Mushroom Moussaka rather than Béchamel sauce and cheese. It doesn’t taste like a lasagne but it does taste really good. And no you do not actually have to bake the courgette slices first but do slice them very thinly. We learn when we learn, ok? 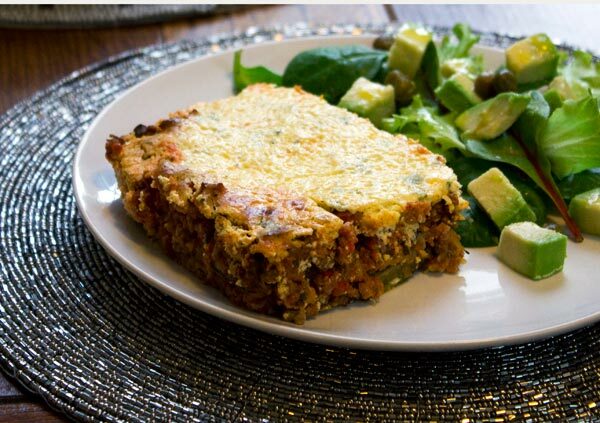 A slice of gluten-free lasagne with a little salad. So I have gone gluten-free. I resisted doing so for a while even though I suspected that I should for some time but – dammit! – I love pretty much all food that contains gluten. Especially pasta, and especially especially lasagne. With lasagne I wasn’t too worried about replacing the actual pasta, it’s more trying to find a good gluten-free Béchamel sauce and I didn’t want to replace the flour with cornflour because I thought this might make it too gummy. What I came up with is a nice topping but it’s not really like a proper Béchamel sauce. I like this and I’ll make it again but I think I will have to revisit the whole good gluten-free white sauce at some stage. But all in all I’m quite happy with my first gluten-free lasagne. I used courgette slices instead of pasta sheets. You can buy gluten-free pasta sheets in a lot of supermarkets now. I didn’t go this route because last summer I experimented with making gluten-free bread with the gluten-free flour mixes and the results were awful. I mean terrible. I know shop-bought gluten-free breads are sometimes quite nice. Usually whatever you make at home yourself tastes better than what you’ll buy in the shops – I’m never sure whether this is really the case or if it just the satisfaction of knowing you made it yourself adds something irreplaceable to the taste. I found when I made gluten-free breads at home there was something very “wrong” with the taste and it’s obvious that there is a huge amount of starch in the gluten-free flour. I’m happy to bake with ground almonds or millet flour or things like that that seem more natural but flour mixes that are a mixture of potato, rice and corn starch – they’re not for me. Since then, when I’m looking to replace something that has gluten, I look for more natural alternatives. There seems to be lots of people replacing pasta with courgette so I basically followed their lead. I think you need to cook the courgette before using it as the pasta sheets. I baked strips of it in the oven. I sliced some of them far too thin. You don’t want them to be at all thick but you don’t want them paper thin either or they will shrivel and burn. I used 2 courgettes but I’m putting down 3 in the recipe because if I sliced them just slightly thicker I think I would have needed 3. 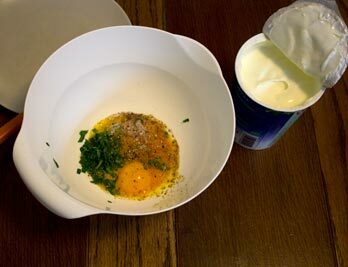 I mince a lot of the ingredients in a food mixer, I find it much quicker than chopping them. You can have the courgettes baking while you are preparing other ingredients in the food mixer. Also I add a sort of olive tapenade which I make with black olives, roasted red pepper, sun-dried tomatoes and a little chili pepper. I bake the red pepper at the same time as I bake the courgette. 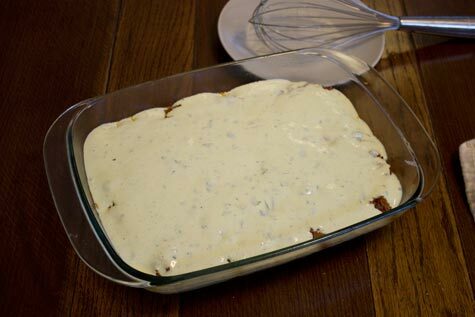 The white sauce topping that I used was based on the gluten-free Béchamel sauce in the Cornucopia Cookbook. Their recipe uses 3 eggs, with 500g greek-style natural yoghurt, grated nutmeg, some mint leaves finely sliced, salt and pepper. The mint works very well in it adding a little sweetness to the yoghurt which is kind of similar to the natural sweetness of the milk in a white sauce. Here I used the 3 egg yolks rather than the whole eggs. I did this because I thought it might make the sauce creamier and less eggy. It actually didn’t make that much difference and since egg whites are very good for you I’ve said to use 3 whole eggs in the recipe down below. I also added some basil leaves and I liked the taste but they did make the sauce slight less sweet that the version using just mint. 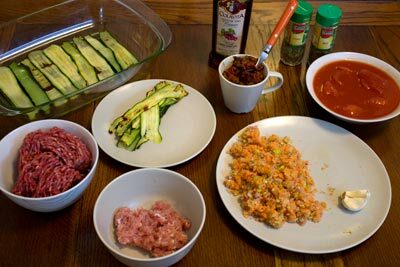 Ingredients for the lasagne filling. Remove the stalk. core and seeds from the red pepper, cover with a little olive oil and bake for 20 minutes or so until the skin is browning and blistering. Then take out leave to cool for a couple of minutes and then you can easily pick off the skin. Slice the courgettes thinly, and place on oiled baking sheets. Bake for 15 – 20 minutes or until they have softened a bit. When ready take out and use them to line the bottom an oiled baking dish. Leave the rest aside on a plate. Peel the onion, carrot and wipe off any dirt from the celery stick. Chop roughly and put in food mixer. Mix until minced as in the picture above. Take out and leave on a plate. Wipe down the mixer. Add the olives, sun-dried tomatoes, roasted (and skinned) red pepper, a good pinch of chili pepper and the red wine vinegar into the food mixer. Mix until you have a tapenade-like mix. Take out and leave aside. Wipe down mixer. Cut off the white fatty bits off the rashers (bacon), chop roughly and put in food mixer. Mix until mixed. Take out, break apart so that it’s loose rather than all clumped together and leave aside. Heat a little oil in a deep frying pan and add the carrot, celery and onion mix. Stir in the dried basil and oregano and cook for about 5 minutes until the mix start to soften. Push the vegetables out to the sides of the pan, turn the heat up to high and cook the mince until it’s just turned brown, reduce the heat to a gentle-moderate setting and crumble in the bacon. Stir around well. Add in the tinned tomatoes, bring the high up to high again and bring to the boil. Add in the garlic. Reduce heat and simmer for 10 minutes. Add in the tapenade and simmer for a further 10 minutes. Taste and season with salt and pepper if necessary. Once it’s ready, pour half of the meat mix over the courgette slices in the baking dish. Layer the remaining courgette slices over this and cover with the remaining meat mix. Beat the eggs and combine with all the rest of the ingredients in a deep bowl. Pour the white sauce over the meat-mix. Bake in the oven at 180 C for about 40 minutes or until the top is nicely set and browned a little. Assembled, ready to go in the oven. A slice of gluten-free lasagne. I can get used to this.